MAY 5--Two California men were indicted today on federal charges that they illegally smuggled Asian songbirds into the country, most recently last month when one of the defendants, returning from a trip to Vietnam, was found with 14 live birds strapped to his legs. As seen in this marvelous evidence photo, Customs and Border Protection (CBP) agents at Los Angeles International Airport discovered the birds under the pants of Sony Dong. According to a Department of Justice press release, CBP agents inspected Dong and "found bird feathers and droppings on his socks, as well as birds' tail feathers visible under his pants." A subsequent search "discovered 14 live birds attached to two flat pieces of cloth that were wrapped around his calves. The birds included three red-whiskered bul-buls (which is listed as an injurious species under federal law), four magpie robins and six shama thrush." 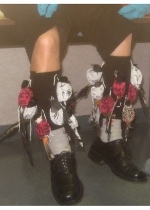 The birds each appear to have been placed in sleeves that were hooked on to the cloth around Dong's legs.